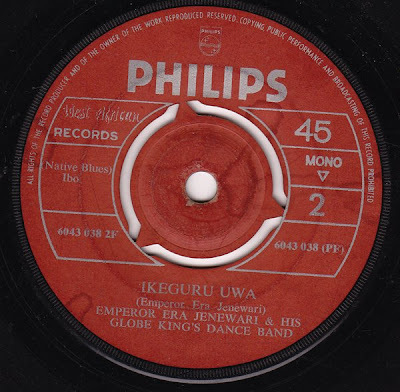 Emperor Era Jenewari & His Globe Kings Dance Band - "Globe King's Special"
Emperor Era Jenewari & His Globe Kings Dance Band - "Ikeguru Uwa"
I think this record was released around 1970 or 71. The last two posts dealt with Izon musician Echo Toikumo and guitarist Benjamin Otaru, who eared his chops under Ijaw bandleader Rex Lawson. 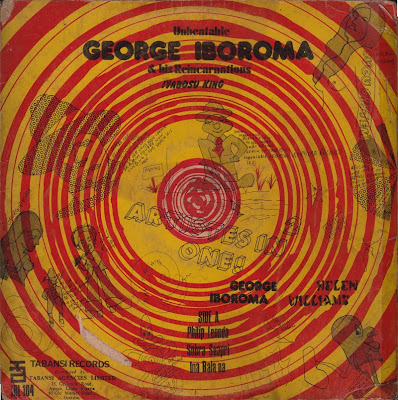 I'd hoped to continue this informal theme of Rivers State-styled highlife today by throwing up some sound by Ijaw singer George Iboroma, but the record I wanted to post needs a little more restoration than I have the time to perform right now. 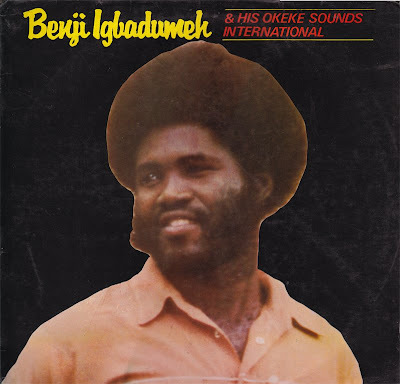 So instead I decided to take the easy route and share this album by Benji Igbadumhe instead. That works, doesn't it? Even though King Benji does not originate from the Ijoid clans, he--like highlife cult legend Waziri Oshomah--comes from the Etsakọ group in northern Edo State, so we still have a "highlife from minority groups" thing going ("minority" in Nigerian parlance refers to any ethnic group that is not Yoruba, Igbo or Hausa/Fulani). And to make things better yet, this record is like VG++/NM! I'll have it ripped in a flash! Alas, this is not how it turned out. For some reason, the record plays funny-style, so there will be a few skips for you, especially on side 2. 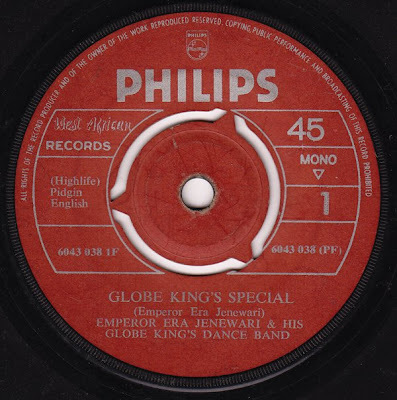 It doesn't detract significantly from these groovy Okeke sounds, though. I think the track that fills all of side 1, "Arofu Nemho Okeke" was a "hit" to some extent in 1984. Either that or it was played as the theme music of some TV show or something, because I remember it quite well though I don't think I've ever actually listened to this record before today. This is another band with a name that is very sweet in the mouth, especially when you pronounce it with a proper accent: AWW-taard-OOSS. The proclamation of that single word from the front cover of a record evokes images of some otherworldly, winged behemoth of mythology. Which is apt, I suppose, as the Otarus sound is fleet and ethereal, and Benjamin Otaru is a beast on the guitar. 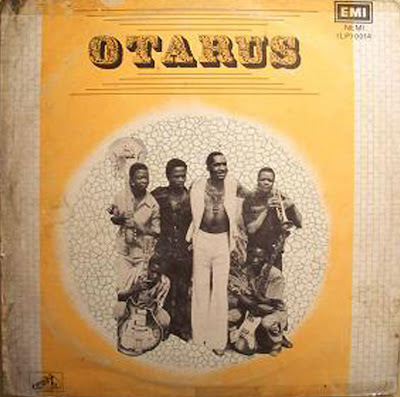 Otaru was born in 1947 in the town of Ewan, in the Akoko-Edo Local Government Area of present-day Edo State, Nigeria. His musical talent first manifested itself while he was a student at St. Paul's Grammar School in Igarra where he played organ in the choir. When he left school, he took a job as a storekeeper at John Holt, but quit in '67 to play guitar in the Gaiki Messengers Band. By 1968 he had joined The Rivers Men, led by the great Rex Lawson, remaining in the band until Lawson's death in 1971. 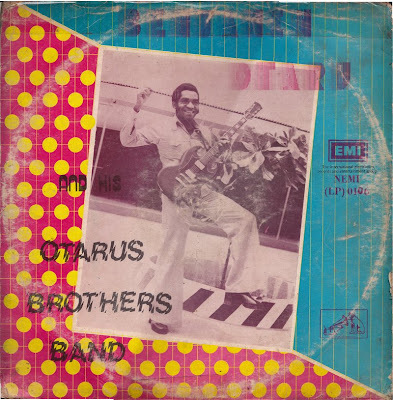 For the next year, Otaru played with St. Augustine's Rovers Band and then broke off to form his own Otarus Brothers International Band in 1972. Based on context clues, I am dating this album, his third, to 1974 or 75. 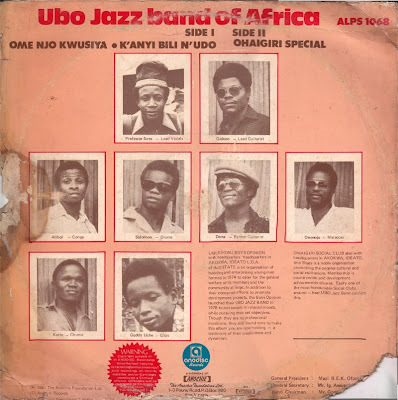 A few months ago, John B. posted a nice series on Likembe spotlighting some of the music from the Ijaw/Okrika/Izon peoples of Nigeria's Delta region. 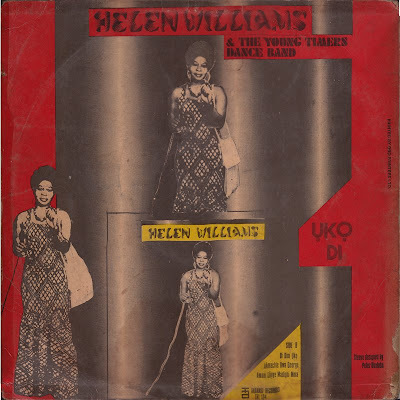 The Ijaw are considered one of Nigeria's "ethnic minorities" and as such, their rich culture and musical heritage are often overlooked, but the area has nurtured a strong highlife tradition (especially in the live performance arena) and produced luminaries of the genre such as Prince David Bull & the Professional Seagulls* and the immortal Cardinal Rex Jim Lawson. The majority of its highlife stars, though, have never not made much of a mark beyond the immediate region but are local legends: Emperor Erasmus Jenewari, George Iboroma, King Robert Ebizimor and of course Echo Toikumo. 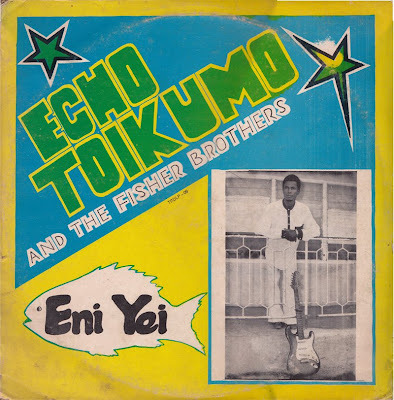 Echo Toikumo's music, like that of most Ijaw dance bands, tends to an urgency and directness that is akin to the jumpy highlife of their their Anioma neighbors. *My man Deinma (that proud son of Okrika) has been bugging me to put up some David Bull music for a while... I'm working on it, D! 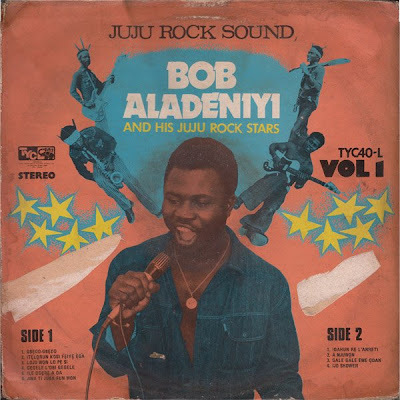 Actually, I don't know for a fact that Bob Aladeniyi is King Sunny Ade's younger brother, but I think he is (anybody in the know, feel free to confirm or repudiate this). 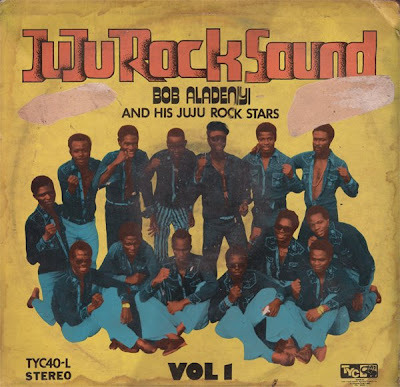 What is certain is that Aladeniyi, with his showy guitaristics, was an integral player in Ade's African Beats. In some quarters, it is believed that he was the true musical voice of the band and that he played most of Ade's licks on record and on stage (Victor Uwaifo in particular has alleged that KSA only "pretends" to play guitar). I don't know about all that... 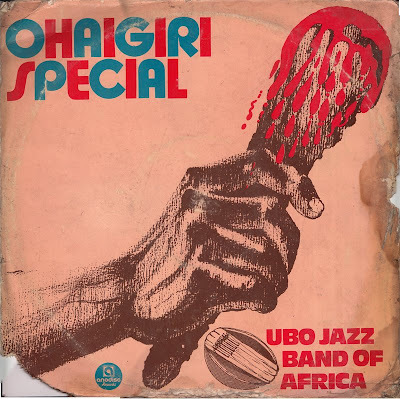 This LP is very much in the same afrobeat-infused vein as much of KSA's later 1970s work; Aladeniyi apparently even attempts to approximate his boss's feathery tenor at times, but his voice is considerably gruffer. The guitar heroics, however, stay as inventive and heavy as ever. Get Yer Ju-Ju's Out... It's Monday! We haven't yet taken a look at Chief Commander Ebenezer Obey but we will... at some point. 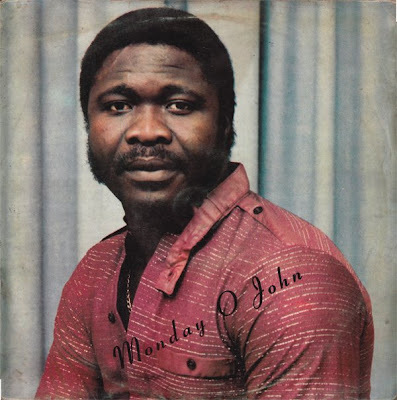 Today we'll just check out a taste from a musician closely associated with Obey, Monday O. John. 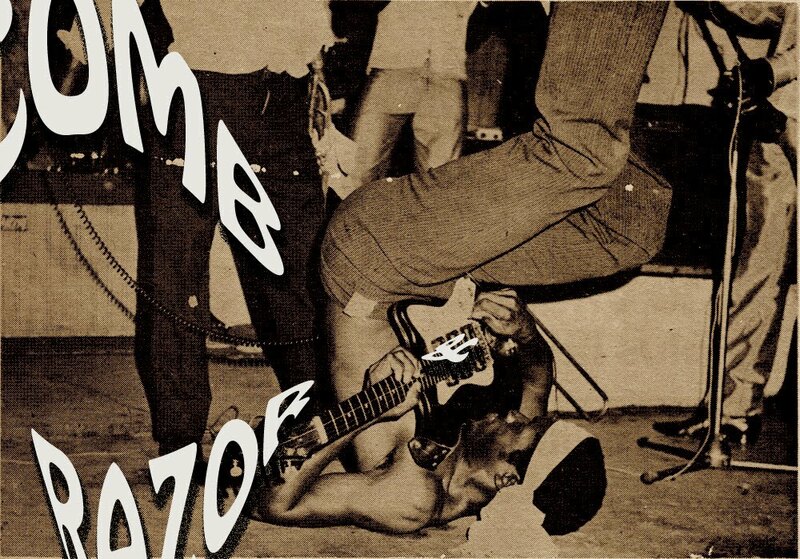 By the early 1970s, Obey had been established for a few years as one of the stand-bearers for a glamorous new era of juju that saw the genre move from gin joints to jamborees, assimilating the cosmopolitan appeal of highlife, the vigorous physicality of rock & roll, the earnest emotionalism of country & western, and the guitar theatrics of Congolese rumba. In the latter department, Obey found himself mostly outmatched by his chief rival, King Sunny Ade, much feted for his guitar wizardry. 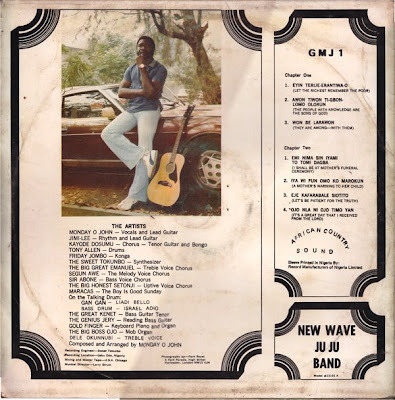 Obey's recruitment of John evened out the guitar stakes between his Inter-Reformers band and Ade's African Beats, or at least made it a reasonable enough debate. This 1983 outing features John leading a band that includes a few musicians more identified with the "rock" genre--conga player Friday Jumbo, guitarist Jimi Lee Adams, keyboard player Goldfinger Papa Doe, Fela's afrobeat co-architect Tony Allen on the drums--and interesting enough, KSA guitar player Kayode Dosunmu.